This paper describes the fit between educational technologies and teacher views and pedagogies in light of two recently completed research projects. These studies focused on observed pedagogies associated with the classroom-based use of two learning technologies: digital video (student-generated), and interactive whiteboards. The paper considers the use of these two technologies from a sociocultural perspective, recognizing that the nature of tools and the nature of societal use of these tools are mutually dependent. Questions are raised about how the inherent nature of different technologies might shape different learning experiences and outcomes and whether certain technologies fit better with some pedagogical approaches than others. Schuck, S. & Kearney, M. (2008). Classroom-based use of two educational technologies: A socio-cultural perspective. 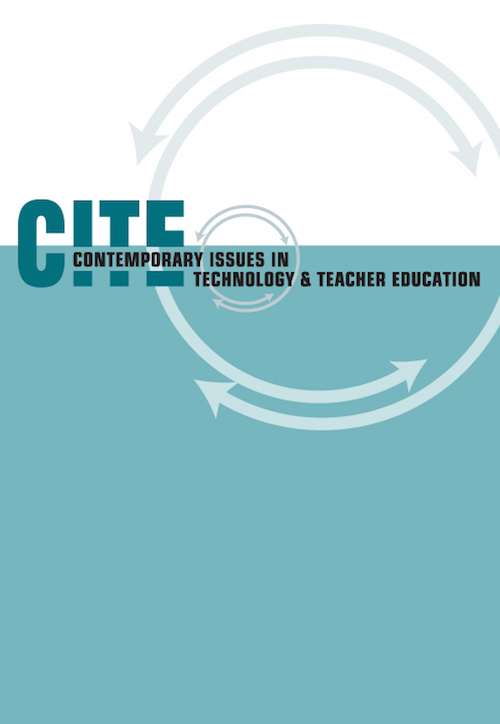 Contemporary Issues in Technology and Teacher Education, 8 (4), 394-406. Waynesville, NC USA: Society for Information Technology & Teacher Education. Retrieved April 26, 2019 from https://www.learntechlib.org/primary/p/26272/. Ayersman, D. (1996). Reviewing the research on hypermedia-based learning. Journal of Research on Computing in Education, 28(4), 500-525. Bogdan, R., & Biklen, S. (1998). Qualitative research for education. An introduction to theory and methods. Boston: Allyn and Bacon. Bonk, C., & Graham, C. (Eds.) (2006). Handbook of blended learning environments. San Francisco: Pfeiffer. Cognition and Technology Group at Vanderbilt. (1990). Technology and the design of generative learning environments. Educational Technology, 31(5), 34-40. Glassman, M. (2001). Dewy and Vygotsky: Society, experience and inquiry in education practice. Educational Researcher, 30(4), 3-14. Erickson, F. (1986). Qualitative methods in research on teaching. In M. Wittrock (Ed. ), Handbook of research on teaching, (3rd ed. Pp. 119-161). New York: Macmillan. Hedberg, J. (2006). E-learning futures? Speculations for a time yet to come. Studies in Continuing Education, 28(2), 171-183. Higgins, S., Beauchamp, G., & Miller, D. (2007). Reviewing the literature on interactive whiteboards. Learning, Media and Technology, 32(3), 213-225. Jonassen, D. (1996). Computers in the classroom: Mindtools for critical thinking. Eaglewood Cliffs, NJ: Prentice Hall. Kearney, M., & Schuck, S. (2008). Exploring pedagogy with interactive whiteboards in Australian schools. Australian Educational Computing, 8-13. Kennewell, S. (2006, November). Reflections on the interactive whiteboard phenomenon: A synthesis of research from the UK. Paper presented at the annual conference of the Association for Active Educational Researchers, Adelaide, Australia. Kent, P. (2004). E-teaching and interactive whiteboards. The Richardson experience. The Practising Administrator, 26(1). Levin, H. (2003). Making history come alive: Students interview Holocaust survivors on camera and publish their stories on the web. Learning and Leading with Technology, 31(3), 22-27. Mehan, H. (1982). The structure of classroom events and their consequences for student performance. In P. Gilmore& A.A. Glatthorn (Eds. ), Children in and out of school. (pp. 59-87). Washington, DC: Center for Applied Linguistics. Ong, W. (2005). Ramus, method and the decay of dialogue: From the art of discourse to the art of reason. Chicago: University of Chicago Press. Papert, S. (1993). Children’s machine: Rethinking school in the age of the computer. New York: Basic. Potter, J. (2005). ‘This brings back a lot of memories’: A case study in the analysis of digital video production by young learners. Education, Communication& Information, 5(1), 5-23. Reeves, T., Herrington, J., & Oliver, R. (2002). Authentic activities and online learning. In A. Goody, J. Herrington, & M. Northcote (Eds. ), Quality conversations: Research and development in higher education, 25, 562-567. Jamison, Australian Capital Territory: Higher Education Research and Development Society of Australasia. Reid, M., Burn, A., & Parker, D. (2002). Evaluation report of the Becta digital video pilot project. Coventry, UK: British Educational Communications and Technology Agency. Rychen, D.S. (2002). Key competencies for the Knowledge Society: A contribution from the OECD project definition and selection of competencies. Stuttgart: UNESCO. Salomon, G., & Perkins, D. (1998). Individual and social aspects of learning. Review of Research in Education, 23, 1-24. Schmid, E.C. (2006). Investigating the use of interactive whiteboard technology in the English language classroom through the lens of a critical theory of technology. Computer Assisted Language Learning, 19(1), 47-62. Shewbridge, W., & Berge, Z. (2004). The role of theory and technology in learning video production: The challenge of change. International Journal on E-learning, 3(1), 31-39.